We are beginning our search for energetic and talented alumni with strong organizational backgrounds to serve as the CUAA’s next leaders. Alumni Trustee, President and other executive level positions are open for terms beginning in 2019. Responsibilities and qualifications may be found at the bottom of this announcement. 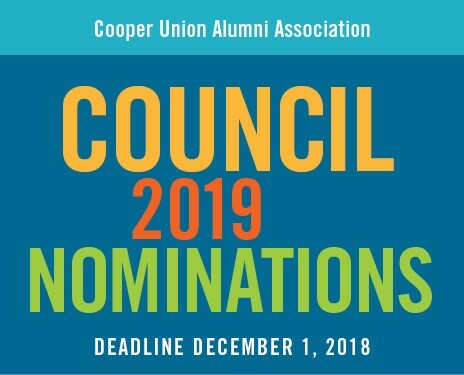 If you or someone you know is passionate about The Cooper Union and wants to lead alumni initiatives for a successful and enduring future, we welcome your/their nomination. To nominate yourself or someone you know, email contact@cooperalumni.org. Please include in the subject line Nomination for (include position). In the body of the email include the name of the nominee and contact information as well as your name and contact information. A member of the Nominating Committee will contact you or the nominee for further information. CUAA’s role is to support our diverse and talented alumni through engagement, advocacy and communications. We work closely with the administration to support Cooper Union’s mission of higher educational excellence and return the school to tuition free. We also offer programs that bring students and alumni together to foster strong relationships for the future. President. The President leads the CUAA, is responsible for its overall management, runs the Executive Committee and Council Meetings and serves as the public face of the association. It is the role of the President to help foster communication and collaboration on behalf of the alumni and the institution across the entire Cooper community, including the administration, faculty, students, Board, and CUAA. Secretary. The Secretary serves to organize and set the agenda for the CUAA Council and Executive Committee meetings. The Secretary is also responsible for keeping records through meeting minutes and End of Year Reports. Treasurer. The Treasurer is responsible for setting, updating and keeping track of the budget for CUAA as well as preparing the documentation for the annual tax return. The Treasurer also distributes funds to various Chairs and members of the CUAA to successfully perform their responsibilities. VP Events. The VP Events involves the organization and planning of annual events as well as ad hoc gatherings. Annual events include: CUAA Orientation, Holiday Party, Peter Cooper Birthday, Awards Ceremony, Block Party and others. VP Faculty-Student Liaison. The function of the VP student/faculty liaison is to strengthen communication between the CUAA and the schools.